Anesthesiology Residency Alumnus Bryan Terry, MD, was elected to represent District 48 in the Tennessee House of Representatives. District 48 includes his home city of Murfreesboro and also covers most of eastern Rutherford County. This was Dr. Terry's first campaign for public office. After his election, Dr. Terry said, "I am grateful for the support of so many people. I look forward to serving all of the constituents in District 48, as well as the state of Tennessee. "As a physician, and especially as an anesthesiologist, I know how critical patient-centered care is for the health of our citizens. At the same time, I understand we need to work together to contain healthcare costs. I know the importance of making the patient's needs the only priority from the time that person seeks treatment to the time they are well. Now that Tennessee has anesthesiologists in both the Tennessee House and Senate, I look forward to working with Senator Steve Dickerson, MD, nd the other physicians in the legislature to be leaders for patient safety and to work with the medical community to provide for the health of all Tennesseans." "To this day, I still remember choosing the program based on the morning reports. I knew that being put on the spot to answer questions in front of colleagues and attending would be uncomfortable, but it would make me a better doctor." 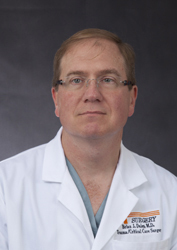 Dr. Terry was an Anesthesiology resident from 1995-1998, serving as president to the Tennessee Society of Anesthesiologists Resident Component during his residency. 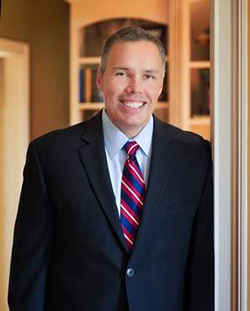 He now practices with Murfreesboro Anesthesia Group, serves as the group's Health Insurance Portability and Accountability Act and Medicare compliance officer, and he also serves on the Physician's Excellence Committee for Saint Thomas Rutherford Hospital. 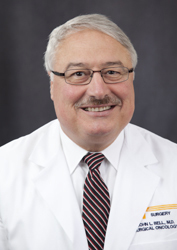 He is a member of the American Society of Anesthesiologists as well as the Tennessee chapter. "I interviewed all over the country for residency, but UTGSM was my top choice," Dr. Terry said. "I was fortunate enough to have matched. While I loved Knoxville, it was Dr. Jerry Epps and Dr. Audie Smith that sold me on GSM as being the perfect fit for me. "To this day, I still remember choosing the program based on the morning reports. I knew that being put on the spot to answer questions in front of colleagues and attending would be uncomfortable, but it would make me a better doctor. I truly believe that the communication skills I honed in front of patients and groups helped me in my election and will help me in office." Read more about Dr. Terry and physicians in legislature via TSA: http://www.tsahq.com/bryan-terry-wins-election. Dr. Ryan Owen presents his DUC research at UTGSM Resident and Fellow Research Day. Urology residents and faculty initiated a difficult urethral catheterization (DUC) team to see if they could improve patient outcomes from catheter placement without urologist intervention. 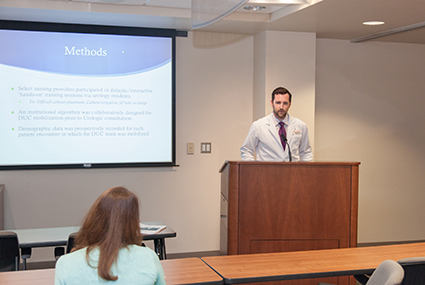 Led by Urology Residents Ryan Owen, MD, and Jared Moss, MD, urologists held collaborative sessions with University of Tennessee Medical Center administrators, nursing supervisors, and emergency staff to identify providers that would be best utilized for the specialized team. Identified team members were invited to participate in didactic and interactive "hands-on" training sessions. They were trained by Urology residents, with W. Bedford Waters, MD, Urology, Professor and Residency Program Director, attending, in difficult catheter placement, catheter irrigation and suprapubic catheter exchange. Between October 1, 2012, and February 28, 2014, the DUC team was called to evaluate 167 patients. The indication for DUC team referral was inability to place a Foley catheter, the most commonly used type of catheter, or a risk factor for catheter placement, including obesity, pelvic radiation or urethral stricture disease. The DUC team successfully placed catheters in 92% of patients, thereby preventing the need for urologic consultation and catheter-related complications. The success of the program is gaining national attention among hospitals. Dr. Owen said that based on their experience, an integrated and collaborative approach between urologists, hospital administration, and nursing personnel is critical for successful establishment, training and implementation of the DUC team. He said that the DUC team at The University of Tennessee Medical Center has continued to grow and that the goal is to have team members trained in difficult catheters on every hospital floor. As lead author, Brian Daley, MD, Professor of Surgery and Program Director of the General Surgery Residency and Surgical Trauma and Critical Care Fellowship, won an award from the American College of Surgeons National Surgical Quality Improvement Program (ACS NSQIP) for best Clinical Abstract at the 2014 National ACS NSQIP conference. His paper, "Participation in a Statewide Collaborative of Surgeons, Hospitals and Insurers Leads to Improved Patient Outcomes and Financial Savings in Surgical Care," tells how ACS NSQIP has been used to improve patient care in Tennessee. Dr. Daley reported that the Tennessee Surgical Quality Collaborative has reduced surgical complications by 19.7% since 2009, saving at least 533 lives and $75.2 million. The hospital collaborative was formed in 2009 as a partnership of the ACS Tennessee Chapter and the Tennessee Hospital Association's Center for Patient Safety, with support from Blue Cross Blue Shield's Tennessee Health Foundation. "Our results show that not only have Tennessee hospitals improved care, but we've been able to sustain these improvements over time," Dr. Daley said. "Our collaborative approach and use of robust clinical outcomes data through ACS NSQIP is an effective model for quality improvement across our state and nationally." ACS NSQIP celebrated its 10th anniversary of improving patient outcomes. It is the leading nationally validated, risk-adjusted, outcomes-based program to measure and improve the quality of surgical care in the private sector. 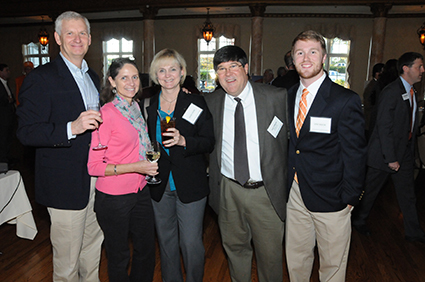 Chancellor Steve Schwab, Executive Dean David Stern and Dean Jim Neutens would like to thank the more than 200 UT College of Medicine alumni and guests who attended COM's Alumni Reception October 24 at Cherokee Country Club. This was the first event in Knoxville for all UT College of Medicine Alumni in many years, and the administration were delighted with the turnout, camaraderie and support of the College. Alumni from East Tennessee and across the country, including Georgia, Florida, Missouri and North Carolina, and ranging in graduation years from 1951 to 2013, came together for an evening of fellowship and celebration. Chancellor Schwab especially thanks special guest Dr. Pat Wall, emcee Dr. Leonard Hines, and Dr. Parks Hitch for his assistance at the Country Club. Also during the event, Chancellor Schwab gave updates on the UT Health Science Center and programs across the state, including Memphis, Chattanooga, Knoxville and Nashville, with an emphasis on their reach and the impact of graduates and residents across the state. Dean David Stern talked about College of Medicine priorities, the importance of the UT Graduate School of Medicine and programs in Knoxville. Also, Dean Neutens talked more in-depth about GSM programs and research as well as increased collaboration efforts between all COM campuses. 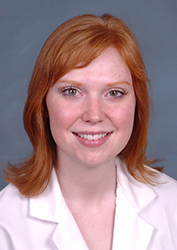 Megan Rooney Thompson, MD, Obstetrics and Gynecology Resident, presented a poster on "The Use of Prostaglandin E1 in Peripartum Patients with Asthma" at the 81st Annual Meeting of the Central Association of Obstetricians and Gynecologists during their October meeting in Albuquerque, New Mexico. She was awarded the Judges Choice Award for Best Obstetrics Poster and received a $500 cash prize. The Central Association of Obstetricians and Gynecologists is one of the oldest and most prestigious obstetrics and gynecology associations in the country and was a founding organization of the American College of Obstetrics and Gynecology in 1951. The association is made up of obstetricians and gynecologists primarily residing in 29 core states including Tennessee. Humberto Rodriguez, MD, Associate Professor in the Department of Obstetrics and Gynecology, was recently awarded the Spirit of Transformation Award by the Centro Hispano of East Tennessee. The Spirit of Transformation Award recognizes an individual who is a transformative spirit, a catalyst for meaningful change for the better in his life, the ones around him, and the community. Dr. Rodriguez is noted by the organization for devoting his life, with his wife, to helping others in need locally and internationally in Peru, Chile, Venezuela, Dominican Republic, Mexico and Romania offering free medical service. He has conducted workshops regarding teen pregnancy at different Knox County schools, and he also has offered free medical service to migrant workers in East Tennessee. The mission of Centro Hispano of East Tennessee is to promote empowerment and civic participation of the Hispanic community through education, advocacy, and social services. The society was developed in 2010 by the Latino Task Force and its umbrella organization, the Community Economic Development Network of East Tennessee. Research is a major component of the work of the UT Graduate School of Medicine and is a growing segment at The University of Tennessee Medical Center as the region's only academic medical center. Research endeavors support two main goals. One is to enhance the mission of healing through extensive research in both the clinical and laboratory settings. The second goal is to gain national and even international recognition as an academic medical center and research institution. One way the latter goal is achieved is through published research in peer-reviewed journals by faculty, residents and medical students. 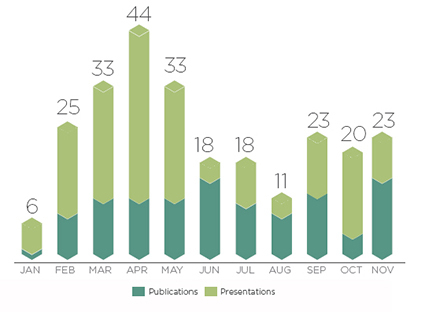 In the 2013-2014 academic year, faculty and residents published or presented research nearly 350 times, which was 20 percent more than the previous year. Published research does have national and international reach. In November, an article published by Rajiv Dhand, MD, Professor and Chair of Medicine, was the second most downloaded article from SpringerLink for the month with 206 downloads. His article, "Inhaled antibiotic therapy for ventilator-associated tracheobronchitis and ventilator-associated pneumonia: an Update," published in Advances in Therapy in 2011. To view SpringerLink's real-time journal metrics, visit http://realtime.springer.com/journal/1865-8652. Springer is a publisher of science, technology and medicine publications with more than 2,900 journals and 190,000 books. In an effort to keep faculty and staff better informed of published research, Dean Jim Neutens is now sending a monthly report of all scholarly activity including publications and presentations to all medical center team members. For more information regarding this monthly listing, contact Graduate Medical and Dental Information. The University of Tennessee Medical Center's Neurodiagnostic Services EEG (Electroencephalography) Lab recently achieved accreditation by the EEG Laboratory Accreditation Board of ABRET (LAB-EEG). It is one of only two hospitals in the state to achieve this distinction. The other hospital is Le Bonheur Children's Hospital in Memphis. The accreditation is valid through 2019. UT Medical Center performs more than 1,000 EEGs each year. EEGs are used diagnostically for many neurological problems, including stroke, seizures, migraines, tumors, headaches and dizziness. 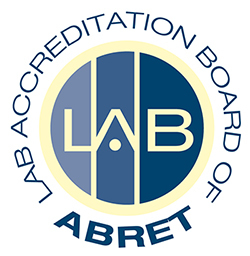 ABRET's Lab Accreditation process involves evaluating technical standards, the quality of the laboratory's output and lab management issues. Successful accreditation means the EEG Laboratory has met strict standards and is to be recognized as a place where patients and physicians can have confidence they are receiving quality diagnostics. The University of Tennessee Medical Center hosted a forum in November on the chronically poor health condition of Tennesseans and citizens in the Knoxville region. The discussion highlighted how the continued poor health status of citizens poses risk to the economic potential and quality of life for Tennessee communities and identified Tennessee-led behavioral and policy initiatives that can lead to improvement. Participants included Joseph R. Landsman, president and CEO of UT Medical Center; Mayor Madeline Rogero, city of Knoxville; Martha Buchanan, MD, director of the Knox County Health Department; Rick Johnson, president and CEO of The Governor's Foundation for Health and Wellness; Edward Capparelli, MD, Oneida physician; Tom Ferriter, CEO, Bush Brothers; Matt Murray, PhD, professor, UT Center for Business and Economic Research; and Rhonda Rice, executive vice president, Knoxville Chamber and Innovation Valley. "Tennesseans may not fully understand the depth of the problem and the consequences," Rick Johnson, CEO of the Governor's Foundation for Health and Wellness said. "The cost, year after year, in human suffering and massive amounts of capital cannot - and should not - be sustained. However, if we can come together and commit to addressing this important issue, we can help people change their unhealthy behaviors and ultimately improve our quality of life, reduce health care costs and the cost of doing business in Tennessee." Tennessee ranks No. 42 among all states in the 2014 America's Health Rankings, an annual analysis of the health of the nation conducted by UnitedHealth Foundation. High rates of smoking (No. 47) and physical inactivity (No. 45) contribute to high rates of diabetes (No. 46) and death from cardiovascular disease (No. 44) and cancer (No. 45). Tennesseans have a high rate of preventable hospital stays (No. 46), poor physical health days (No. 45) — statistics that illustrate the high costs of workplace absenteeism, disability and health insurance costs. The cost of treating preventable, chronic disease in Tennessee is about $6 billion a year, according to analysis by the Governor's Foundation for Health and Wellness. A statistical snapshot of the health of the public, including Knox, Grainger, Blount, Sevier, Anderson, Loudon, Roane, Union and Jefferson counties. How the area's poor health status poses a threat to future economic opportunity, quality of life and state and local financial resources. A moderated panel comprised of regional health, business and economic development leaders will discuss this area. Improving the area's health profile will require local solutions involving health, business, political and civic leadership, innovative policies and access to care. See what community members said about the health forum via Twitter #HealthTN.